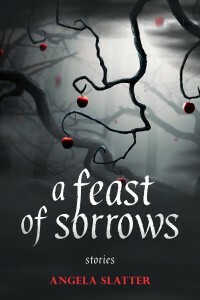 A Feast of Sorrows: Stories is a new collection from Prime Books, containing twelve reprints and two brand new novellas. The lovely Theodora Goss has agreed to write the Introduction. And it will contain the first three stories from The Tallow-Wife collection which will be out in or about 2017. Pre-order details as they come to hand. A Feast of Sorrows — Angela Slatter’s first U.S. collection — features twelve of the World Fantasy and British Fantasy Award-winning Australian author’s finest, darkest fairy tales, and adds two new novellas to her marvelous cauldron of fiction. Stories peopled by women and girls — fearless, frightened, brave, bold, frail, and fantastical — who take the paths less traveled by, accept (and offer) poisoned apples, and embrace transformation in all its forms. Reminiscent of Angela Carter at her best, Slatter’s work is both timeless and fresh: fascinating new reflections from the enchanted mirrors of fairy tales and folklore. Acknowledgement: The final editing of A Feast of Sorrows: Stories was made easier with the kind assistance of the Katharine Susannah Prichard Writers Centre (during my Established Writer-in-Residence gig there) and the Copyright Agency’s Cultural Fund (which helped with funding).